Chinese carrier Juneyao Airlines Co. Ltd. (Juneyao Airlines) is scheduled to receive its first Boeing 787-9 Dreamliner this September, making it the first Chinese private airline to receive a widebody, long-haul jet airliner. Juneyao Airlines recently unveiled the livery plan for its 787 fleet. 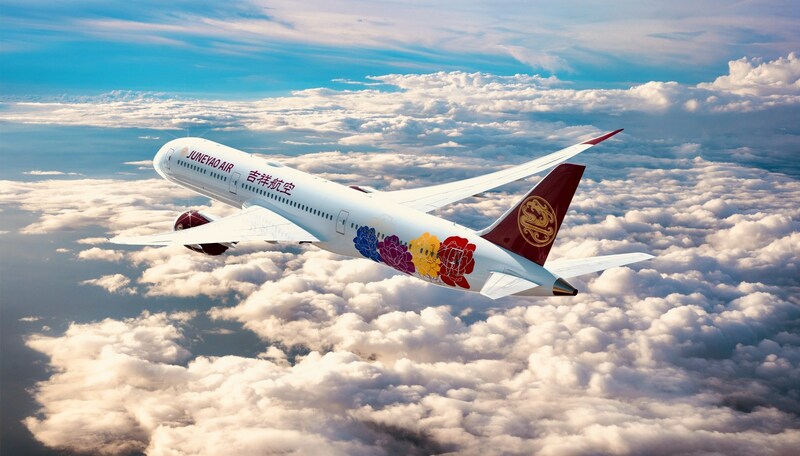 Juneyao Airlines' first Boeing 787 aircraft will be delivered with a colorful Chinese peony-themed livery. Peony, the national flower of China, is synonymous with grace and elegance and reflects the Chinese airline's brand and vision for itself in terms of upcoming plans for development. The new design is meant to depict the airline's hope and expectations for a peaceful, powerful and prosperous China. The aircraft, together with Juneyao Airlines' painted fleet of Airbus A320, which received the livery in preparation for the carrier's recent celebration of its 10th anniversary, also served as an announcement of the airline entering a new era, whereby it is operating with both Boeing and Airbus aircraft. The airline will continue with the Chinese Red livery, the color that is representative of China and of promise for the future and that was applied in the A320/1 series, and extend it to the Boeing 787 to showcase that promise around the world. In addition, the Chinese Ribbon livery design, which outrivaled other proposals in a public livery competition, will be used on the Boeing 787, demonstrating Juneyao Airlines' support for the direction that China is taking and its dedication in contributing to the country's One Belt, One Road initiative. Juneyao Airlines is also taking the lead when it comes to the design and configuration of the cabins in the Boeing 787. The Business Class section has been fitted with 180-degree lie-flat Thompson Vantage XL seats, each with a 42-inch pitch and arranged in a 1-2-1 configuration. Economy Class features Recaro CL3710 nine-way adjustable headrests and seats equipped with warm, fantasy lighting, in-flight HD entertainment systems with 12-inch screens, standalone USB interfaces, and other facilities allowing passengers to feel pampered during their flight. According to the delivery schedule announced by the airline and the aircraft manufacturer, Juneyao's first Boeing 787-9 will arrive at Boeing's general assembly line on August 8, and, during the month of September, be put through paintings and trial flights. Final delivery will take place in late September or early October. The airline expects to take delivery of three painted 787 planes between now and the end of the year. At first, the planes will service some key domestic routes before being transitioned to the airline's first grouping of long-haul, intercontinental routes. Juneyao Airlines, a subsidiary of Shanghai Juneyao (Group) Co. Ltd., is one of the airlines to emerge after China's aviation industry started to grow rapidly on the heels of the rollout of China's reform and opening-up policy. Shanghai Juneyao (Group) took the lead in expanding into the industry via charter flight operations. In 2006, Shanghai Juneyao (Group) made its first foray into the aviation sector when Juneyao Airlines successfully completed its maiden flight. By mid-2018, Juneyao Airlines was operating 68 single-aisle A320 planes. Last year, the airline placed an order for 10 Boeing 787 Dreamliners, in a move to meet the needs of its rapidly growing international network. Juneyao Airlines is committed to furnishing best of class aviation services by providing passengers with high-quality, friendly services and conveying its brand philosophy of happiness, good fortune and Chinese culture to more passengers.